Hello, As producer of Gung Haggis Fat Choy™ - Seattle, it is my hope that you can join us Sunday, 24 February 2019, for this unique event. For our thirteenth year we are celebrating Chinese (Asian) Lunar New Year 2019 (Year of the Boar) and the 260th birthday of Robert Burns, the bard of Scotland. This year we are again at China Harbor Restaurant, 2040 Westlake Ave. N. overlooking Lake Union, in Seattle. The doors will open at 4:00 pm with an open bar and meet and greet. Program will start at 5:00 pm with our own Gung Haggis Fat Choy program opening (Lion Dancers and Bagpipes.) This will be followed with our own inimitable Gung Haggis Fat Choy Presentation of the Haggis and the reciting of Robert Burns’ famous “Address to the Haggis”. Each Gung Haggis Fat Choy™ - Seattle dinner is a fund raiser for Chinese and Scottish youth music, dance, and martial arts scholarship programs. While the program for Gung Haggis Fat Choy™ varies from year to year, we try to keep a balance between Scottish and Chinese entertainment with a full evening of cultural variety. This year the Northwest Junior Pipe Band will perform and we hope to dive into this very talented pool of exceptional young musicians. Ticket price is only $45.00 per person for a nine-course Chinese banquet dinner. Seating is limited to 25 tables (250 seats.) Early reservations and tables of 10 will receive preferred seating, as available. For additional information, or to purchase tickets, contact me at (206) 364-6025, or e-mail me at billmcfadden@mindspring.com. "This is Who We Are: Scots in Canada". Photo taken in Edinburgh, October of 2009. Gung Haggis Fat Choy! Huh?! 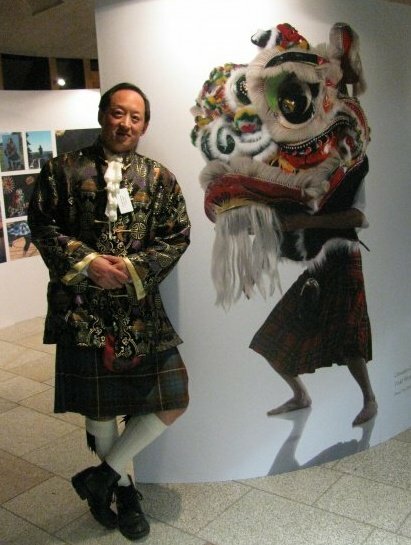 In 2007 Bill McFadden, then President of the Caledonian & St. Andrew's Society, introduced Todd Wong's trademarked production of "Gung Haggis Fat Choy" to Seattle. Billed as "A Celebration of Chinese New Year and Robert Burns' Dinner", the laughter-filled evening included haggis, a delicious Chinese dinner, Pipes & Drums (traditional and fusion style), sing-alongs (including "When Asian/Scottish Eyes are Smiling" and "My Haggis/Chow Mein Lies Over the Ocean"), Poems, The Address tae the Haggis (delivered in rap to an enthusiastic and responsive crowd) and Auld Lang Syne sung in both Mandarin Chinese and English.